i think i may have mentioned this before, but i was a picky eater growing up. dear ol’ mom was nice enough to keep some things on hand for me, including freezer chicken patties (which i can prepare several ways!) and hot dogs. this is one of my favorite ways to have a hot dog. recent trips to the dog of nashville have inspired me to revisit some of my favorite ways to eat a dog. this recipe is for four hot dogs, multiply as needed. in a medium frying pan, cook hot dogs in pizza sauce, stirring sauce constantly. 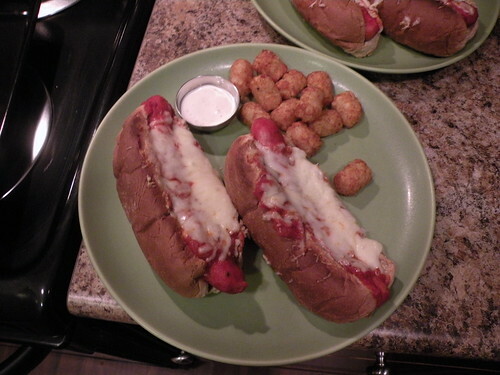 place hot dogs in buns, spooning additional sauce on top. Your other favorite version of this was to just put a slice of Velveta cheese (cut in half diagonally) on top of the vienna and broil till melted. Whalla!! Cheese dogs!! !